A Grammy-nominated musician has lost his eye after being brutally attacked in Brooklyn, N.Y., with a hammer, according to a friend who is helping raise funds for his recovery. Police confirmed the report and said they are searching for the suspect. Dru Barnes was walking home to Fort Greene from Bedford-Stuyvesant at around 11 a.m. on July 11 when he realized he was going in the wrong direction. When the 34-year-old turned around, on Jefferson Avenue near Howard Avenue, he was hit in the face with the claw-end of a hammer. 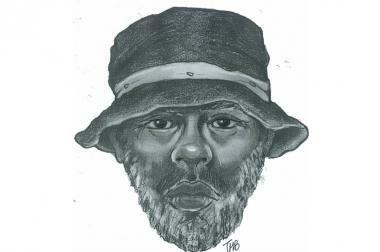 NYPD released a sketch of the assailant on Wendesday. The man said nothing at all during the attack, police told The Huffington Post. "To be honest, having been hit in the head with a hammer, it's a miracle Dru is alive -- and even more so that there's no brain damage at all," Barnes' friend Gerritt Vooren, whose apartment Barnes had just left before the assault, wrote on the "Dru Barnes healing" Facebook page. Barnes, however, has lost his left eye. "His eye was laying on his cheek," Vooren, who rushed to the hospital two hours later after hearing of the attack, told HuffPost of seeing his injured friend. "It was f*cking horrific." Vooren said a doctor told him it was "one of the most severe injuries" she'd ever seen. The claw of the hammer severed Barnes' optic nerve and destroyed the muscles that allow the eye to move, Vooren said. After a string of anti-gay attacks in New York City this year, Vooren and others initially worried Barnes may have been the victim of such an assault. The NYPD told HuffPost, however, that they are not investigating the incident as a hate crime. Vooren could only speculate as to the attacker's motive. "Doesn't have to be anti-gay," Vooren said. "Maybe anti-eccentric?" Vooren also suggested the attacker simply could have been "deranged." Barnes, who is undergoing operations to prepare his eye for prosthesis, is a Grammy-nominated reggae artist from the band JOGYO. A practicing Buddhist, Barnes told Vooren that the attack must have "happened for a reason" and that he's "going to find out why," Vooren said. Vooren and his boyfriend launched a gofundme page to help pay for Barnes' medical expenses. As of Friday afternoon, they had raised $18,735 of their $25,000 goal. A sketch of the assailant is below. Anyone with any information regarding the attack is asked to call Crime Stoppers at (800) 577-TIPS.